On May 17th, between 7pm and 8pm EST, I will post my newest clipshow to YouTube. The first person to email me (alonzomosleyfbi@yahoo.com) the complete and correct list of 88 titles will win a DVD prize pack. There's no fee to enter, but only one entry per person, please. I'm doing this all out of my own pocket to celebrate the upcoming birth of my first child in June (and this is easier than passing out cigars to all of you). So tune in on May 17th, and good luck! Not sure. 29 seconds in, John Wayne in a raccoon hat? Update: Kaedrin friend gmichailovic mentions that this is probably The Alamo (1960). Duh, he plays Davy Crockett. Not sure. 31 seconds in. Stupid tapdancing musical of some kind. 38 seconds in. Not sure. 41 seconds in. I want to say Mary Poppins but... you know what, I'm virtually positive this is Mary Poppins, even though I haven't seen it in like 25 years. Let's go with that. Not sure. 47 seconds in. Is that Paul Newman? Update: Kaedrin friend Larry thinks this might be Cat on a Hot Tin Roof, a movie I have not seen, but which might be right. Not sure. 55 seconds in. Not sure. 59 seconds in. Not sure. 1:24 in. Song says something about cheaters, and this is reminding me of something like The Color of Money, but I can't tell... Update: Commenter grasskit notes that this is Lock, Stock and Two Smoking Barrels, which makes sense. Not sure. Obviously a war movie, probably Vietnam era, but still not sure. Not sure. 1:36 in. B&W western. Not sure. 1:56 in. 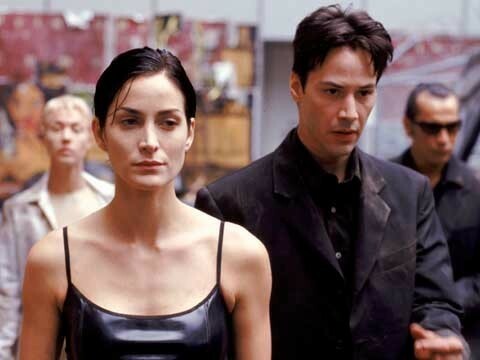 That looks like Carrie-Anne Moss, so perhaps one of the Matrix movies or Memento? Not sure. 2:06 in... Update: Another from commenter grasskit: The Great Escape. Again, I've not seen it, but it looks right. Also not sure. Stupid musicians. Update: Finally, another from commenter grasskit: I'm Not There. So I'm reasonably sure of about 68 out of 88. Of those, there are a few I'm not positive about (again, marked with an *), but I think I did alright considering how hard some of those were... Of the ones I don't know, I made a couple guesses, but I'm pretty sure they're wrong. Can you help fill in any of the gaps? Oooh, smacking my head about the godfather one, except that it has to be Part II (probably) or Part III (why would that be included). 80 is definitely a Matrix movie. First one, I believe. There are a couple more that you didn't get that look familiar (the kid holding the passed out blonde in the blue dress is *killing me*. I *know that one! *), but I can't remember the names yet. Ahh, Duck Soup. It's been perpetually ranked like, 30, in my netflix queue. Ahhh, I get it now. The leather is reflective, which makes the shirt look white in the clip (or at least, not black leather), which is what was throwing me. Score.